Day 2: Waking up at 6.30 AM in the cold morning of 30th Nov 08, to lit some fire to make coffee, tea and breakfast was all but fun. With fog all over we collected small twigs and dry leaves to start fire, by 7.30 AM all of us sipped some hot coffee and tea. We left a vessel with water to boil for instant noodles, which was our breakfast. Rolling back the sleeping mats, packing bags, freshening up followed by getting ready to face the leeches was prime priority. Finally by now our own Shilpa Shetty (Prabath's nick name) was ready. We smeared our legs with snuff mixed in coconut oil and lots of salt to ensure that the leeches do not attack us. Breakfast never tasted better, we were all ready for “Operation Brahmagiri”. Our guide Mohan was quite reluctant, given the fact that it was very foggy, visibility was too low and wondered if it was worth the effort to go up the peak. We were not even remotely thinking about not going up to the peak, so with all the “josh” we started the trek from Narimalai Guest House at 9.00 AM. We are climbing up the 2nd highest peak in Karnataka, the peak was not visible at all, other than the path ahead it was a whiteout, and due to the wetness the leeches were trying their best to cling to us. After an hour long uphill trek we reached the top of the hill only to see every thing completely white. Wind was gushing at the top speed, there was some glimpse of the green carpet around the hill, but still it was just unclear. We decided we would hang around till 10.30 AM and trek down, hoping the fog would clear, the weather god I guess heard our wishes and at 10.20 AM the air lifted the fog slowly all across the valley, it looked like a 70 mm movie. I had never seen anything like this at all, and there was no end for the pictures we were clicking all around. Finally “Operation Brahmagiri” was a great success. With big smiles on our faces we walked down to the same track down to Irapu Falls thinking about all that we had done the last 2 days. Day 0 & Day 1: We left Bangalore at around 10.30 PM on 28th Nov 08, to reach Srimangala forest office at 6.30 AM via Gonikoppal. The Forest officials offered us the IB to freshen-up, while they prepared the approval formalities for the trek. It took a long time than usual, once forest office cleared us we rushed to Irapu Falls. 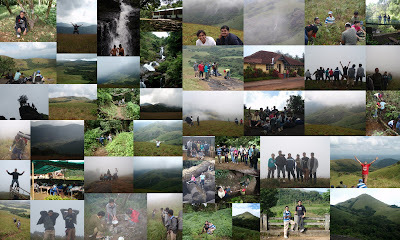 After breakfast at Lakshmanateertha Hotel, we started the trek, it was already around 10.00 AM. In a way it was good that we were late, as heavy rains the previous day had activated the leeches. We applied snuff, coconut oil and salt and some of us very smartly had got the leech proof getters (kind of socks). It was a long trek, and we took it all easy, crossing the little streams, water spots and thick cover of forest. The leeches were tryin their best to attack us, and it was Vishnu’s 1st trek, he was cursing himself for registering for the trek. The view around was breathe taking, and we tired it all out to the Narimalai Guest house by 1.30 PM. Munikal caves was not far of, so we decided to finish the trip to the caves and return for lunch. The rocks at the caves were wet, but going around in the caves was a lot of fun. We came back to the guesthouse, and made some hot coffee and tea as we chilled out, rested and played dumb charades. With a lot of hot soup and chapattis with dal for dinner we hit the bed in no time. With still leeches on mind, Kirthik dreamt of the rain and the leeches attacking him all night long. Day 2: Leaving behind the memories on day 1, we reached Irapu Falls, initially some of them decided to skip the falls, but water is too good to leave, so it was fun in the beautiful Irapu Falls. At sharp 2.00 PM we reached the hotel for lunch, and left Irapu early so that we could try for a safari in the Nagarholai forest. To our bad luck, due to rains the safari was cancelled. We drove down slowly, and reached a place were there we 4 captive tuskers, and it was the best we could get after spotting the deers all through the way. We took pictures with the elephants and got out of the forest as late as we could. En-route to Bangalore a good heavy dinner at Kamath Janapada Loka and we reached the city by 11 PM. Finally it was a well spent weekend with all the good things that happened all through the trek.